Jennie’s brother and fiancé have both been killed in the Civil War which jeopardizes Jennie’s position in her aunt and uncle’s household. When she finds herself getting closer to her dead fiancé’s brother Quinn, strange things start happening. Are ghosts trying to tell her something? The atmosphere and all the lovingly rendered period details really sucked me into this one. It was a quick read with a mostly satisfying twist at the end (the fact that it was so surprising had to do more with a bit of a lack in the character development, imho). Although Jennie is of marrying age which makes this YA, the novel is written with a certain simplicity that reminds me more of middle grade novels. This was one of the books I took with me on my Dublin trip, and the first I started after Finn died. I kept wondering if the spirit photographer would be willing to take a picture of me to see if Finn would show up. He'd probably be biting my ear! PICTURE THE DEAD is available in hardcover now. 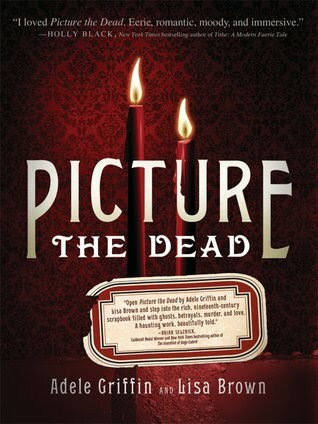 Find out more about it at http://www.picturethedead.com/. I bet Finn would be doing exactly that! The book sounds like a good one. this story totally sounds captivating and I'm sure Finn would be right there nibbling on your ear!! Every time I read a review of this book, I want it a bit more. I have been reading a bit about the Civil War and think this book would dovetail nicely with that. I will have to look for this one. Already on my TBR list and now I'm wanting to read it even more. It just sounds like a pretty unique and interesting storyline. What more could you ask for? I've had my spirit/aura picture taken before. It was kind of neat. I should find that picture. Sob, I'm sure Finn would be there. I have this one here and am very curious about it. I agree, this book could be a a great middle grade read.